Rated Best in Council and awarded the Journey to Excellence Gold Unit Award in 2017, Pack 1344 has been serving Burke for 30 years and still going strong! We are in the Patriot District of the National Capital Area Council of the Boy Scouts of America and chartered by the Burke Volunteer Fire & Rescue Department. They oversee our Cub Scout Pack and ensures a quality cub scouting program. Pack 1344 participates in their annual firehouse clean-up prior to the firehouse open house and performs the ceremony to start the open house. Our program is offered for boys from kindergarten through fifth grade. 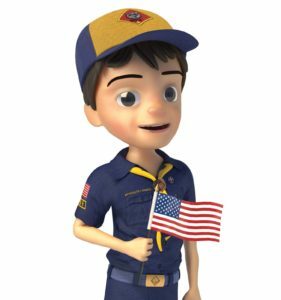 Most of the boys attend Cherry Run Elementary School, however, other boys in the community that do not attend Cherry Run and are interested in scouting are also welcome to join. We invite you to attend a meeting! We have monthly pack meetings that are held at St. Andrew’s Episcopal Church while Cherry Run Elementary School is under renovation. Each individual den also meets separately from the pack. Their meeting days and times vary. Please contact us for more information about the meetings and outings. Some Fun Things We Do!! Click on any of the links below to find out more information about that event.